Q.1 What is covalent bond and covalent compounds? Q.2 Why carbon forms covalent bonds? To complete the octet, carbon can gain 4 electrons or lose 4 electrons. But if carbon gains electrons, it would be difficult for nucleus to hold 4 extra electrons as the carbon atom is very small in size. If carbon loses its electron, it would require a large amount of energy to remove 4 electrons as attraction force of nucleus is more in carbon atom. Thus, it is difficult for an atom of carbon to either gain or lose electrons. So, carbon forms four covalent bonds and attains the noble gas configuration by sharing its valence electrons. Q.3 What are the important properties of covalent compounds? 1. Covalent compounds are made up of molecules , not ions. 2. 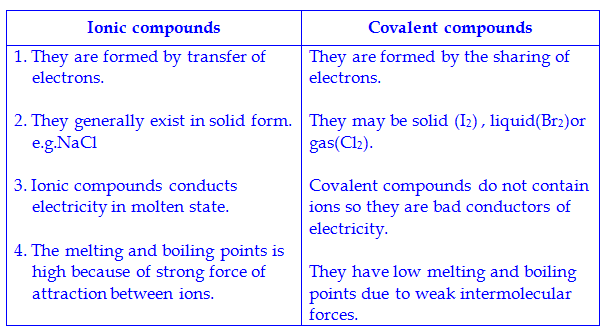 Covalent compounds have low melting and boiling point because they have weak inter molecular forces. 3. Covalent compounds are bad conductors of electricity because they do not posses ions. 4. Covalent compounds are generally insoluble in water. Q.4 Carbon is tetravalent. Explain? Carbon atom has four valence electrons in its valence shell and it needs four more electrons to complete its octet. Thus, carbon gets these electrons by mutual sharing d forms four covalent bonds. So, valency of carbon is four i.e. tetravalent (tetra = 4,valent = valency).These valencies are represented by four single lines, i.e. Q.5 Draw the tetrahedral structure of carbon. Carbon forms four covalent bonds and it does not lie in a plane but are directed towards the four corners of tetrahedron. The angle between two adjacent valencies is 109.5o known as tetrahedral angle. Carbon has small size and carbon – carbon bond shows great strength so it has a unique ability to combine with other carbon atoms to form long straight or branched chains and rings of different sizes. This ability of carbon is known as “Catenation”. Q.7 How do carbon exist in nature? 2. Combined State : Carbon combines with other elements to form compounds such as carbon dioxide (CO2), glucose (C6H12O6), sugar (C12H22O11) etc. Q.7 What are the differences between ionic compounds and covalent compounds? Q.8 What is the difference between homoatomic and heteroatomic? Q.9 What would be the electron dot structure of carbon dioxide (CO2)? Carbon dioxide is a compound consists of two oxygen atoms, covalently double bonded with a carbon atom. Q.10 Draw the electron dot structure of a molecule of sulphur ( S8 ). 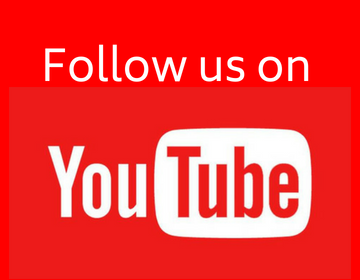 The atomic number of sulphur is 16. Thus, sulphur atom has 6 electrons in the valence shell. Therefore, it needs two more electrons to complete its octet and to acquire nearest noble gas electronic configuration. Thus, each sulphur atom shares its two electrons. Q.11 Draw the electron dot structure of phosphorus ( P4 ) consists of four atoms. The atomic number of phosphorus is 15. Thus, phosphorus has five electrons in the valence shell. Therefore, it needs 3 more electrons to complete its octet. 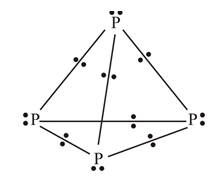 Thus, phosphorus atom shares its three valence electrons, one each with three other phosphorus atoms. Q.12 Apart from the organic beings, where else do we find carbon? Mention the form in which it is available there and also its percentage. Carbon is found in atmosphere and earth’s crust. Carbon is found as CO2 in atmosphere and as minerals in earth’s crust. The percentage of carbon in air is 0.03% and in earth’s crust about 0.02%. It is very very helpful site for study.